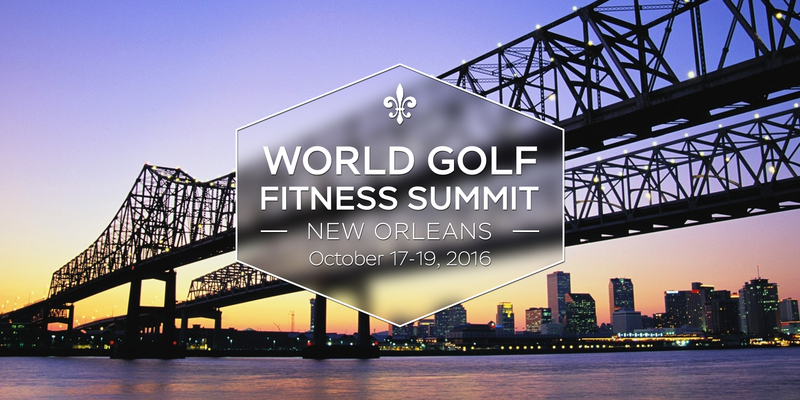 Dr. Ben Langdown is a featured speaker at the 2016 World Golf Fitness Summit. The following article is based on his 2014 presentation at the WGFS (with colleague Jack Wells). In his presentation at the Summit this October, Langdown will present his findings from two research studies that explored the relationship between musculo-skeletal screenings and swing characteristics. Golfers will do just about anything to enhance their performance on the course. From a new practice tool to the latest driver, nothing seems too extravagant or silly when in pursuit of a few extra yards. What would you say if there was another way that could allow your clients to gain extra yardage (as much as 45 yards on carry distance of a driver!) and costs next to nothing? It may sound simple but here is the alternative strategy for more distance…a warm-up routine!! In other sports people warm their bodies up in preparation for the activity ahead without even thinking about it or questioning why they are doing so. What the majority of golfers seem to forget is that golf is similar to sprinting in that it is a very explosive action which culminates in a lot of force traveling through the body over a very short period of time. Yet despite the similarities you wouldn’t see a sprinter stroll out to the track and try to compete, without performing an appropriate warm-up routine. However, in golf we know that there is a stigma attached to warming up or stretching properly on the range or prior to teeing off. It is time to change the embarrassed culture that exists in our sport when it comes to warming up prior to performance. What can we learn from this? Not even the best players in Europe have a consistent warm-up routine and are possibly lacking the understanding of what preparation works best for their performance. There is a selection of research out there now to show that static stretching is not useful for a warm-up routine as it can reduce power output! This is surely a physical attribute that all golfers want to maintain as high as possible for their driving and long game! There are various papers that have shown that dynamic stretching can increase jump test height and power output with increases up to 14% across studies. Hadad et al (2014) reported that even 24 hours after dynamic stretching there was still a 1.6% increase in power output!! This research is very relevant to golf because the forces we create and transfer to the clubhead start by pressing into the ground as they do in a jump test. Power is not the only area to suffer as a result of static stretching: Fowles et al. (2000) showed that strength is also reduced immediately after the stretch by up to 28% and still by 9% an hour later! So, completing static stretching at home before you head to the golf club to tee off can actually reduce your performance! Control Warm-Up: Hitting 20 balls before being tested on 10 drives. No stretching. 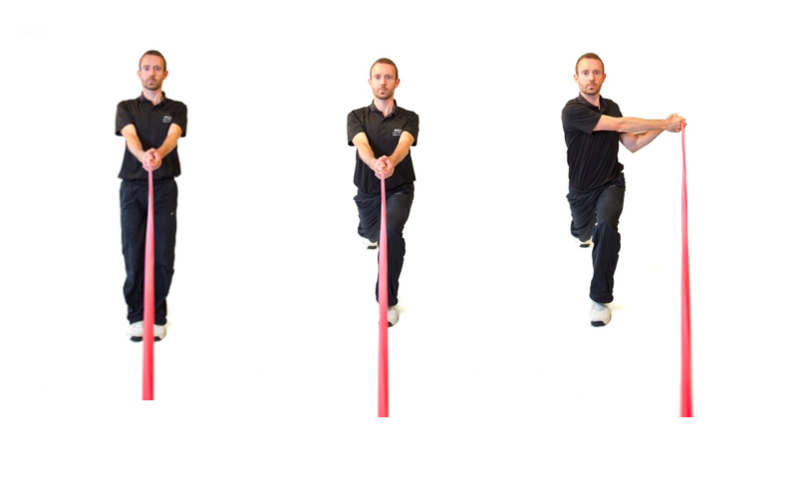 Dynamic Stretching: Conducting 5 simple exercises to mobilise and activate the muscles used in the golf swing before being recorded on the launch monitor. This included movements such as Overhead Squats, Open and Close the Gate and Clock Lunges (pictured below). 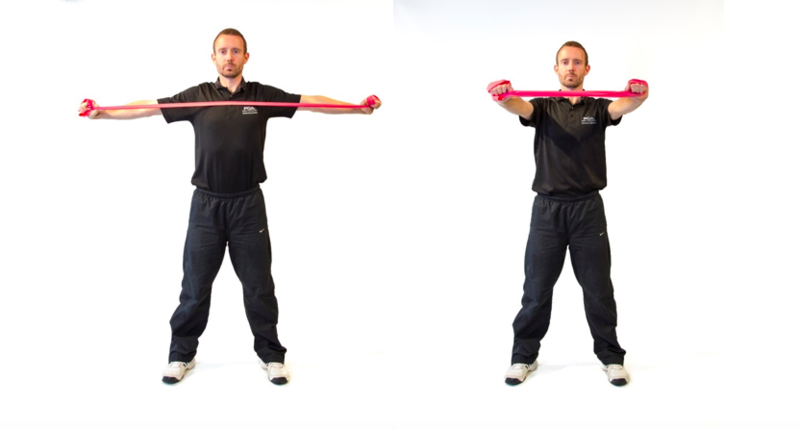 Resistance Band Warm-up: Using a mini-band and a theraband, golfers performed 5 simple resisted exercises prior to hitting 10 drives to be assessed on performance. 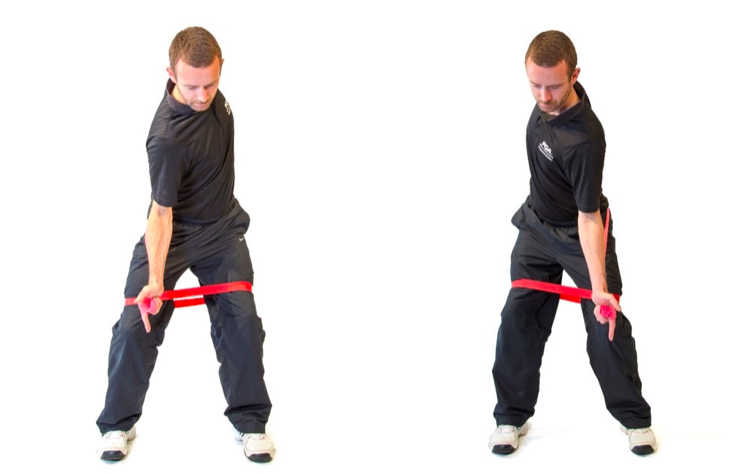 Coaching points: Place a mini band around both legs just above the knees and hold a piece of tubing or theraband behind your back with a pistol grip. Keeping the elbows tucked into the side and the chin pulled back into a neutral position, begin to circle the hands backwards. Do not force the shoulders back and stick the chest out, as this is not a neutral position. Instead, gently pull the shoulder blades down and in as if sliding them into an envelope on your back. Once you have got the arms going begin some side steps, like a crab! Make sure your feet stay apart throughout the exercise and the closest they should ever get is the width of your stance in your golf address position. You should feel the glutes, mid-back and triceps after 20 steps in each direction. Speed Skaters: A resisted gluteal warm up exercise. Coaching Points: Using a mini band, placed around both legs just above the knee, you should keep the torso tall and skate back and out to the side with alternating legs. You can imagine there is a raw egg behind you on either side, when you skate back you are not allowed to smash the egg with your toe tap on the floor! In other words, control the movement, use that front leg to squat down slightly and then return to a tall standing position after each rep. Complete 1 set of 6 reps each side to begin. Shoulder Blade Retractions: Pulling a band apart for 30 seconds while maintaining good posture. Lunge and Rotate: a backward lunge away from the resistance and turning over the front knee. Complete 1 set of 6 reps each side. Stomp and Rotate: foot stomping with resistance around the legs and a band between the hands rotating into the backswing and follow-through. Continue stomping for 30 seconds. 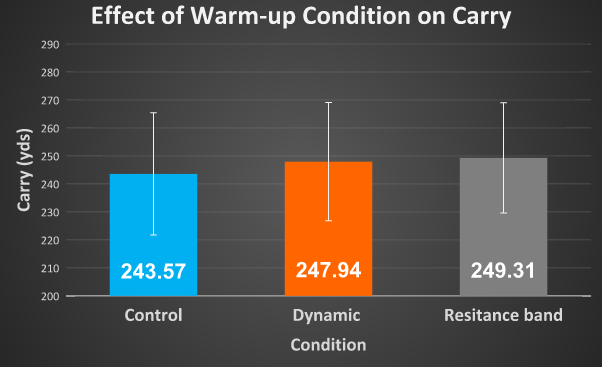 Although carry distance also increased there was no statistical difference between any of the warm-up conditions so further research would need to be carried out to assess the impact of warm-ups on this. Looking deeper into the data and pulling out a couple of case studies it was evident that some players were working too hard in the resistance band warm-up protocol and this became more of a workout for them rather than a warm-up. 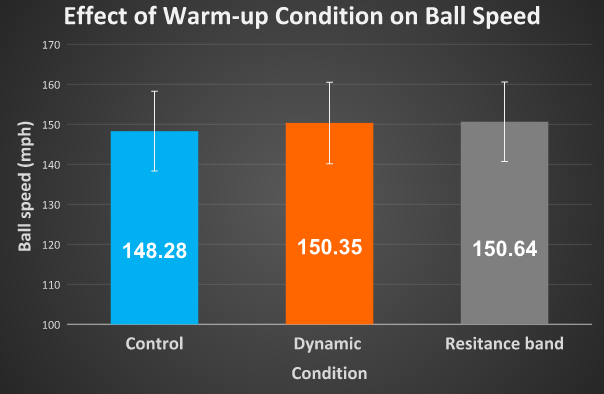 In this case the improvement compared to the control condition in CHS, Ball Speed and Carry wasn’t as great as it was following the dynamic stretching (11 yards increase with resistance band warm-up compared to 17.4 yards increase with the dynamic stretches). Some people reported no change in all performance variables and there could be many reasons for this. One final case study demonstrated that it may well be worth opting for a warm-up over a new driver with carry distance increases of 37.5 yards with the dynamic stretches and 44.5 yards with the resistance band protocol compared to the control condition of hitting 20 balls! The gluteals are some of the most important muscles in the golf swing (they are sometimes referred to as “The Kings”) and this research has shown that by engaging them within the warm-up there can be staggering results for some individuals! 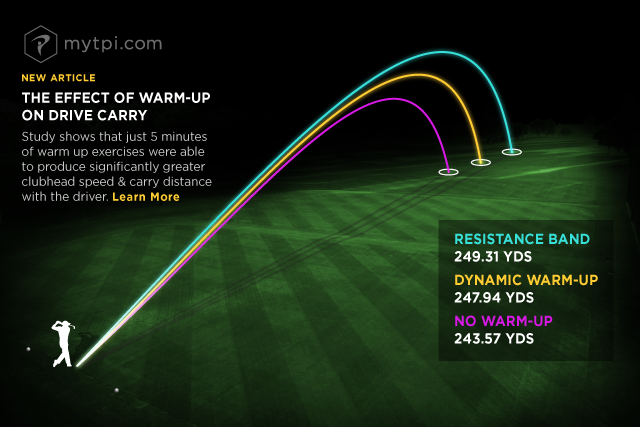 Don’t expect to achieve this amount of extra carry but don’t be surprised if you feel more prepared and are swinging the clubhead a little faster when walking onto the first tee following an effective warm-up! Dr. Ben Langdown was head of Sports Science at The PGA National Training Academy at The Belfry for over 10 years and is now lecturing and researching in Sports Coaching at The Open University (@OU_Sport). Alongside this Ben works with many elite amateur and professional golfers providing strength and conditioning support. Ben has a PhD in the field of golf biomechanics, studying movement variability and strength and conditioning for golf. Having previously presented research on golf swing centre of pressure displacement and warm-up protocols at two previous WGFS, his most recent research has focused on the relationships between physical screening and 3D golf swing kinematics. Follow Ben and the OU Sports Team at @BenLangdown and @OU_Sport. Do you have a link to the Open/Close the Gate & Stomp & Rotate drills? I can't locate them in the TPI library. Thanks. Do you have a link to a research paper for this study? If not, is there anywhere is where I can find more information about the exercise protocol? For example, what does a stomp and rotate look like? Thanks! Awesome article! 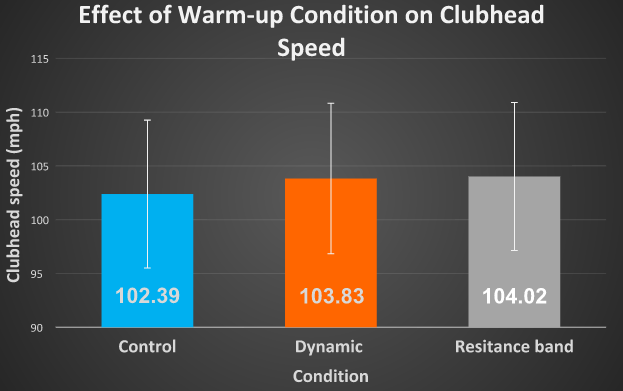 The transition from no warm-up (or static stretching) to dynamic and resistive band warm-ups needs to become more of a focus for golfers before their round or even before going to the practice range. Too many golfers go from sedentary jobs to the first tee without any sufficient warm-up only opening themselves up to poor play, frustration, and injury. Great article! Dr. Ben Langdown.